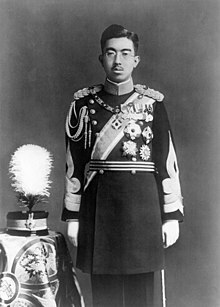 An tImpire Hirohito ag síniú Bunreacht na Seapáine ar an 3 Samhain 1946. B'é an tImpire Shōwa (昭和天皇, Shōwa tennō) (29 Aibreán, 1901 – 7 Eanáir, 1989) an 124ú Impire na Seapáine idir an 25 Nollaig 1926 agus lá a bháis sa bhliain 1989. Sa Domhan Thiar tá aithne níos fearr air mar an t-Impire Hirohito, an t-ainm pearsanta a thugtaí air le linn a shaoil (tugadh an t-ainm Shōwa air tar éis a bháis). Tugadh an leathanach seo cothrom le dáta an 28 Márta 2017 ag 15:03.